After introduction of the midline sternotomy into clinical practice, sternal infection rates began to rise; this was directly associated with high complication rates. Initially, sternal dehiscence was treated conservatively with open drainage and debridement with packing. Complications included graft exposure, desiccation of wound margins, osteomyelitis, and, ultimately, death. These complications often led to significant morbidity, with reported mortality rates exceeding 50%. Shumaker and Mandelbaum introduced the concept of closed management with catheter-antibiotic irrigation in 1963. This reduced mortality rates from 50% to 20% overall. Despite this dramatic reduction, catheter-induced erosion of major vessels and resultant fatal hemorrhage was a major risk. Thus, incentive to improve methods of wound care continued. One of the most common reasons for mediastinal infections, and ultimate sternal dehiscence, is sternal instability. Following a sternotomy, the structural integrity of the sternum is significantly compromised. This explains the importance for the surgeon to take time and use meticulous technique when performing a sternotomy. If a midline sternotomy is not placed properly, sternal instability is almost certain to follow, and the patient is at a much higher risk for mediastinitis. The use of vascularized regional tissue allowed for greater blood flow, obliteration of dead space, and faster healing time directly from quicker infection resolution. Since the introduction of the omental flap, several other flaps have been introduced to repair chest wall defects. The institution of flaps have led to a decrease in mortality rate of 10%. A broad range of surgical strategies are currently being used including myo/myocutaneous flaps. In order to address the issue of bony sternal repair, several institutions are now turning toward sternal rewiring and reconstruction with rigid sternal fixation using transverse and longitudinal plates. [8, 9, 10, 11, 12, 13, 14, 15] Additionally, a sternal clamp device, to reduce sternal instability, has now been introduced into the market with promising results, although long-term clinical data are not yet available. Problems associated with sternal dehiscence include issues both before and after debridement. Predebridement issues include frank infection and bony destruction of the sternum. Postdebridement issues include possibly sternal instability, paradoxical motion, and pain. Current literature reflects that anywhere from 0.5-8.4% of median sternotomy incisions are complicated with wound infections, leading to sternal dehiscence. [9, 12, 13] With the introduction of flaps to cover sternal defects, mortality rate from sternal wound dehiscence is approximately 10%. [9, 12, 13] Long-term mortality studies following rigid fixation have yet to be reported. Many mechanisms have been proposed to explain the development of sternal wound infection and dehiscence. These theories include inadequate sternal fixation leading to instability and dehiscence of the overlying skin incision and inadequate surgical drainage. Further theories suggest a localized ischemic osteomyelitis. This theory suggests that sternal wires become loose, leading to sternal instability, which ultimately leads to skin dehiscence and osteomyelitic infection. The most commonly cultured organism is Staphylococcus Aureus. Wound dehiscence is the partial or complete separation of the layers of the incision. A compromise in factors responsible for wound healing can lead to wound dehiscence. These factors include inadequate nutrition, compromised circulation, and surgical factors. Surgical factors include placing sutures under excessive tension or insufficient tension. Circulatory factors include the presence of diabetes, coagulopathies, or other vascular-related issues. Adequate nutritional intake is also required for proper wound healing. Factors associated with mortality include septicemia, perioperative myocardial infarction, and use of the intra-aortic balloon pump. Strict aseptic technique, attention to hemostasis, and precise motionless sternal approximation are advocated to prevent mediastinitis. In the clinical evaluation of suspected mediastinitis or sternal dehiscence, careful repeated examination of the patient is warranted. If the patient has multiple risk factors for dehiscence or impairment to wound healing, he or she must be examined at closer intervals. Findings of erythema, fever, tachycardia, increased leukocyte count, purulent discharge, and sternal instability are clinical indicators of sternal dehiscence. If clinical deterioration of the patient or further signs of breakdown are observed (ie, increased erythema, drainage, separation of incision), immediately obtain wound cultures, administer broad-spectrum antibiotics, and perform swift aggressive debridement. Follow with either the vacuum-assisted closure (VAC) device (to serve as a bridge to reconstruction) or reconstruction with flap coverage or rigid sternal plating. This combination can reduce the incidence of mortality, decrease hospital stay, rapidly propel the patient's recovery from thoracic surgery, and avert the severe complications of mediastinitis. Pairolero and Arnold have based their classification of sternal wounds on timing of presentation of infection; this classification divides wounds into 3 categories. This classification system does not indicate the type of reconstruction necessary for management of each type of sternal wound. Type II and III wounds are typically referred to plastic surgeons for reconstruction. Type I: Type I wounds occur in the first few days postoperatively, contain early wound separation with or without sternal instability, and are characterized by serosanguineous drainage without cellulitis, osteomyelitis, or costochondritis. Type II: Type II wounds occur within the first few weeks and are characterized by drainage, cellulitis, mediastinal suppuration, and positive cultures. Type II wounds are characterized by fulminant mediastinitis. Type III: Type III wounds occur months to years after surgery and are characterized by the presence of chronic draining sinus tracts, localized cellulites, osteomyelitis, or retained foreign bodies. Mediastinitis is a rare complication of type III wounds. The main indications for sternal reconstruction are sternal instability with dehiscence, early or subacute infections, and repair after tumor resection. The chest wall skeleton consists of the sternum in the anterior midline, bilateral clavicles, 12 pairs of ribs, with the eleventh and twelfth not associated with costal cartilage. The first seven ribs are "true" ribs, and the last 5 are "false" ribs. The eighth, ninth, and tenth ribs attach to the sternum via costal cartilage. The eleventh and twelfth ribs articulate posteriorly with the vertebrae. 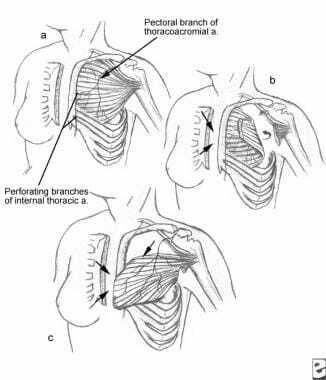 Anterior chest wall muscles allow for movement of the extremities. The elasticity of the chest wall supports the mechanics of ventilation. The paired internal thoracic arteries and the deep epigastric arteries provide the main blood supply to the ventral aspect of the chest. This system connects the major vessels of the neck to those in the groin. Many flaps are based on understanding this vascular supply. Collateral blood supply from the acromiothoracic axis is also important to recognize. The relevant muscles and structures utilized for sternum reconstruction are the pectoralis major, rectus abdominus, latissimus dorsi, and greater omentum. All except the latissimus dorsi can be harvested in the supine position; the latissimus dorsi should be harvested in the lateral decubitus position. The blood supplies for each flap are well-established and described under each individual section. Understanding the advantages and disadvantages of all reconstructive options is important. For example, the pedicled latissimus flap is a great flap for lateral chest wall defects but often is inadequate to cover large midline sternal defects. The blood supplies for each flap are well-established, as shown below. 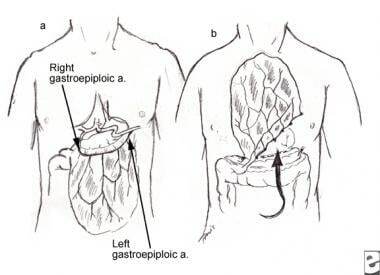 Pectoralis major muscle flap blood supply and options for sternal coverage (a, b, c). Omentum flap showing its blood supply based on the right or left gastroepiploic arteries. Wounds with active purulence require extensive debridement prior to flap coverage and/or rigid fixation. Additional contraindications for sternal reconstruction are found in patients who are unstable for surgery, including those with poor pulmonary function, poor cardiac reserve, or terminal illness. Hemodynamic stability is required for surgical intervention in patients with sternal dehiscence. Kaul P. Sternal reconstruction after post-sternotomy mediastinitis. J Cardiothorac Surg. 2017 Nov 2. 12 (1):94. [Medline]. [Full Text]. Shumacker HB, Mandelbaum I. Continuous antibiotic irrigation in the treatment of infection. Arch Surg. 1963. 86:384. Lee AB Jr, Schimert G, Shaktin S, Seigel JH. Total excision of the sternum and thoracic pedicle transposition of the greater omentum; useful strategems in managing severe mediastinal infection following open heart surgery. Surgery. 1976 Oct. 80(4):433-6. [Medline]. Schols RM, Lauwers TM, Geskes GG, van der Hulst RR. Deep sternal wound infection after open heart surgery: current treatment insights. A retrospective study of 36 cases. Eur J Plast Surg. 2011 Dec. 34(6):487-492. [Medline]. [Full Text]. Jurkiewicz MJ, Bostwick J 3d, Hester TR, et al. Infected median sternotomy wound. Successful treatment by muscle flaps. Ann Surg. 1980 Jun. 191(6):738-44. [Medline]. Mathes SJ. The muscle flap for management of osteomyelitis. N Engl J Med. 1982 Feb 4. 306(5):294-5. [Medline]. Argenta LC, Morykwas MJ, Marks MW, DeFranzo AJ, Molnar JA, David LR. Vacuum-assisted closure: state of clinic art. Plast Reconstr Surg. 2006 Jun. 117(7 Suppl):127S-142S. [Medline]. Astudillo R, Bugge M, Cha SO, Niebuhr U, Brose S, Tjomsland O. Reconstruction of chronic aseptic sternal pseudoarthrosis after median sternotomy: initial experience with the Ley prosthesis. Heart Surg Forum. 2008. 11(1):E46-9. [Medline]. Dickie SR, Dorafshar AH, Song DH. Definitive closure of the infected median sternotomy wound: a treatment algorithm utilizing vacuum-assisted closure followed by rigid plate fixation. Ann Plast Surg. 2006 Jun. 56(6):680-5. [Medline]. Plass A, Grunenfelder J, Reuthebuch O, Vachenauer R, Gauer JM, Zund G. New transverse plate fixation system for complicated sternal wound infection after median sternotomy. Ann Thorac Surg. 2007 Mar. 83(3):1210-2. [Medline]. Raman J, Straus D, Song DH. Rigid plate fixation of the sternum. Ann Thorac Surg. 2007 Sep. 84(3):1056-8. [Medline]. Voss B, Bauernschmitt R, Brockmann G, Lange R. Osteosynthetic thoracic stabilization after complete resection of the sternum. Eur J Cardiothorac Surg. 2007 Aug. 32(2):391-3. [Medline]. Voss B, Bauernschmitt R, Will A, Krane M, Kross R, Brockmann G. Sternal reconstruction with titanium plates in complicated sternal dehiscence. Eur J Cardiothorac Surg. 2008 Apr 30. [Medline]. Fawzy H, Osei-Tutu K, Errett L, Latter D, Bonneau D, Musgrave M, et al. Sternal plate fixation for sternal wound reconstruction: initial experience (retrospective study). J Cardiothorac Surg. 2011 Apr 29. 6:63. [Medline]. [Full Text]. Sahin MA, Doganci S, Guler A. Repair of sternal dehiscence with titanium mesh plates: the sandwich technique. Thorac Cardiovasc Surg. 2011 Feb. 59(1):49-50. [Medline]. Danter MR, Saari A, Gao M, Cheung A, Lichtenstein SV, Abel JG. A New Device for Securing Sternal Wires After Median Sternotomy: Biomechanical Study and Retrospective Clinical Assessment. Innovations (Phila). 2018 Jan/Feb. 13 (1):40-6. [Medline]. Fu RH, Weinstein AL, Chang MM, Argenziano M, Ascherman JA, Rohde CH. Risk factors of infected sternal wounds versus sterile wound dehiscence. J Surg Res. 2016 Jan. 200 (1):400-7. [Medline]. Pairolero PC, Arnold PG. Management of recalcitrant median sternotomy wounds. J Thorac Cardiovasc Surg. 1984 Sep. 88(3):357-64. [Medline]. Song DH, Wu LC, Lohman RF, Gottlieb LJ, Franczyk M. Vacuum assisted closure for the treatment of sternal wounds: the bridge between debridement and definitive closure. Plast Reconstr Surg. 2003 Jan. 111(1):92-7. [Medline]. Horacio GS, Coltro PS, Albacete A Neto, et al. Application of Unilateral Pectoralis Major Muscle Flap in the Treatment of Sternal Wound Dehiscence. Braz J Cardiovasc Surg. 2017 Sep-Oct. 32 (5):378-82. [Medline]. [Full Text]. Molenkamp S, Waterbolk TW, Mariani MA, Werker PM. Predictors of Complications After Pectoralis Major Transposition for Sternum Dehiscence. Ann Plast Surg. 2017 Feb. 78 (2):208-12. [Medline]. Davison SP, Clemens MW, Armstrong D, Newton ED, Swartz W. Sternotomy wounds: rectus flap versus modified pectoral reconstruction. Plast Reconstr Surg. 2007 Sep 15. 120(4):929-34. [Medline]. Nahai F, Rand RP, Hester TR, et al. Primary treatment of the infected sternotomy wound with muscle flaps: a review of 211 consecutive cases. Plast Reconstr Surg. 1989 Sep. 84(3):434-41. [Medline]. Cicilioni OJ, Stieg FH, Papanicolaou G. Sternal wound reconstruction with transverse plate fixation. Plast Reconstr Surg. 2005 Apr 15. 115(5):1297-303. [Medline]. Pai S, Gunja NJ, Dupak EL, et al. In vitro comparison of wire and plate fixation for midline sternotomies. Ann Thorac Surg. 2005 Sep. 80(3):962-8. [Medline]. Voss S, Will A, Lange R, Voss B. Mid-Term Results After Sternal Reconstruction Using Titanium Plates: Is It Worth It to Plate?. Ann Thorac Surg. 2018 Jun. 105 (6):1640-7. [Medline]. Zahiri HR, Lumpkins K, Kelishadi SS, Zhu Y, Medina D, Condé-Green A, et al. Significant Predictors of Complications After Sternal Wound Reconstruction: A 21-Year Experience. Ann Plast Surg. 2012 Jan 5. [Medline]. Tarzia V, Carrozzini M, Bortolussi G, et al. Impact of vacuum-assisted closure therapy on outcomes of sternal wound dehiscence†. Interact Cardiovasc Thorac Surg. 2014 Jul. 19(1):70-5. [Medline]. Rectus abdominus muscle flap and eighth intercostal perforator for coverage of sternal defects. Latissimus dorsi can be used as an island flap to cover the anterior chest and sternal defects. Open, infected sternal wound before debridement. Chest wall reconstructed with pectoralis major myocutaneous flap. Chest wall infection after debridement of all nonviable and infected tissue. Chest wall reconstructed with right unilateral pectoralis major muscle flap for sternal wound closure. Harvesting of transverse rectus abdominis myocutaneous (TRAM) flap to cover sternal defect. In this case, the internal mammary artery (IMA) was previously harvested for a coronary artery bypass graft. Chest wall reconstruction following sternal infection using a free transverse rectus abdominis myocutaneous (TRAM) flap. The authors and editors of Medscape Drugs & Diseases gratefully acknowledge the contributions of previous authors Sanjay K Sharma, MD, and Saleh M Shenaq, MD†, to the development and writing of this article.